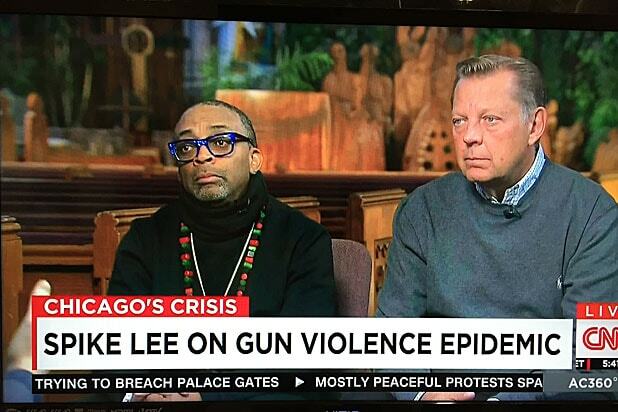 Spike Lee tackles the epidemic of gun violence in Chicago in his upcoming film “Chi-Raq,” and on Wednesday the filmmaker told CNN’s Anderson Cooper that social media is partly to blame for the escalation in homicides in the city. The controversial director appeared on “Anderson Cooper 360” beside a Chicago priest, Father Michael Pfleger, for a three-part interview in response to 9-year-old Tyshawn Lee’s brutal murder last week. “Through Father [Pfleger], I met two of his peacekeepers who told me that social media is a major element of violence. People post something on Instagram, Twitter or Facebook and others respond to it — not by typing something on their phones but by bang, bang, bang,” Lee told Cooper. “I care about human beings, what is happening in Chicago, in Brooklyn where I am from, the Bronx, ‘Killadelphia,’ New Orleans… South Central,” the filmmaker said. “There is a growing hopelessness that I have seen over the years,” Father Pfleger added, describing his home city. In 1998, Pfleger’s own foster son, Jarvis Franklin, was killed by crossfire in a gang-related shooting. When Cooper asked why Lee focused on the epidemic in Chicago over other U.S. cities in “Chi-Raq,” which is the nickname used for the city’s war-zone-like South Side, he replied: “Chicago is the canary in the coal mine. Lee’s satirical film about gun violence stars John Cusack (in a role similar to Father Pfleger’s real-life persona), Nick Cannon, Teyonah Parris, Samuel L. Jackson, Wesley Snipes, Angela Bassett and Jennifer Hudson. It is written by Lee and Kevin Willmott. In the latest act of senseless violence, fourth grader Tyshawn Lee was killed on his way to play basketball in a local park after being intentionally targeted because of his father’s alleged association with a local gang on Chicago’s South Side, according to Cooper. Police say he was lured into an alley and shot multiple times in the face and back. “Tyshawn was not in the wrong place. The murderer, the executioner, the assassin — he was in the wrong place,” Father Pfleger said Tuesday at Lee’s funeral during his passionate eulogy. So far this year, there have been nearly 400 murders and more than 2,200 shootings in Chicago, Pfleger said. 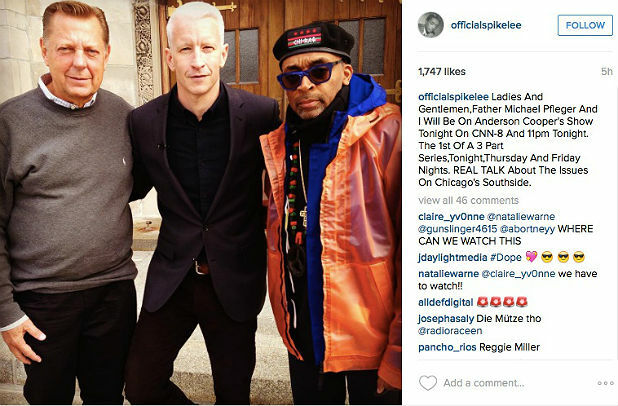 The rest of Cooper’s interview with Spike Lee and Pfleger will air on Thursday and Friday. “Chi-Raq” is due to premiere on Dec. 4 in limited release in theaters. It will then be available on Amazon Instant Video shortly thereafter.